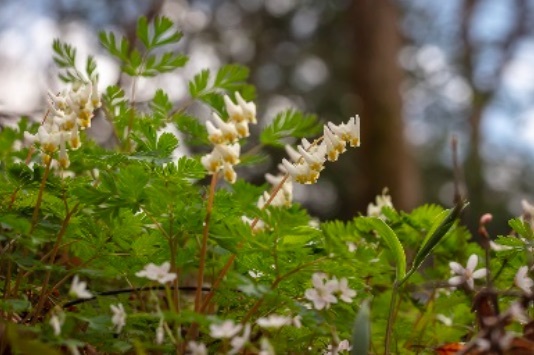 Spending time in AOA’s beautiful forests can be very peaceful and therapeutic – as well as providing opportunities for viewing the many beautiful wildflowers and camaraderie with fellow conservationists. 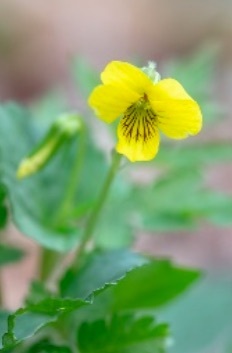 You can help us make a difference and enhance the quality of the rare and wonderful native habitats at our preserves. 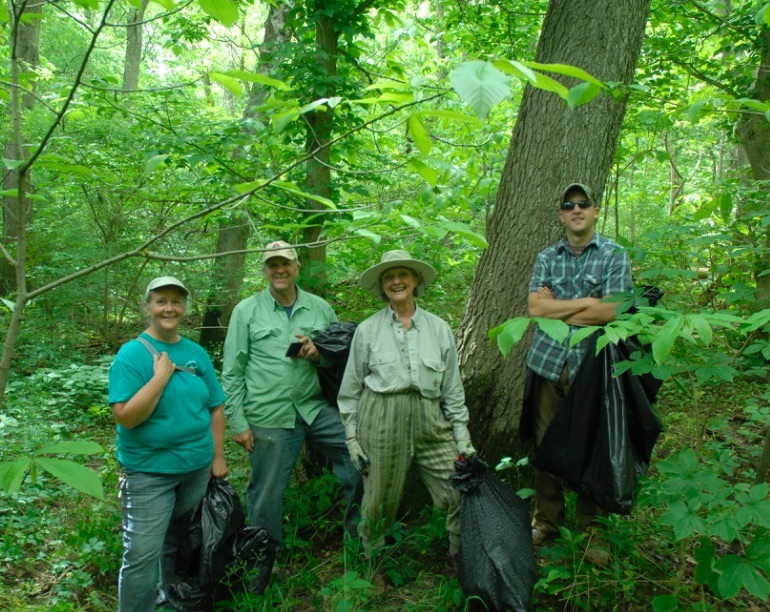 We need your assistance to combat the Garlic Mustard and invasive scourge on our preserves. We know garlic mustard pulling is not the most glamorous activity, but it is badly needed to protect our native wildflowers. We cannot do it alone. We have scheduled a series of organized work days each week for volunteers to visit our preserves and assist with our habitat protection and stewardship activities. Please join us. Enjoy a birding expedition to the wilds of the Scioto River at AOA’s sprawling Marsha Gunder Schneider Preserve in Pickaway County. We will hike a variety of bottomland habitats searching for early migrants that are winging their way north along the Scioto River flyway. 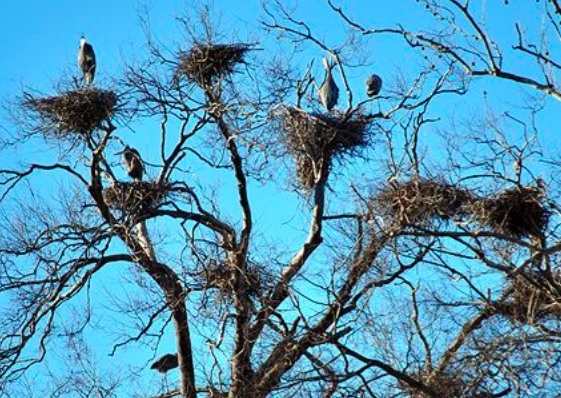 We will also check out the resident birds and summer breeders in the area – plus the heron rookery and squatting bald eagle nest in the large sycamore trees along the river. Mike Galloway will lead this hike. All levels of birders are welcome. Making up for the rain-impacted hike two weeks ago AOA has scheduled a new hike to view the wildflowers at AOA’s Bison Hollow Preserve. 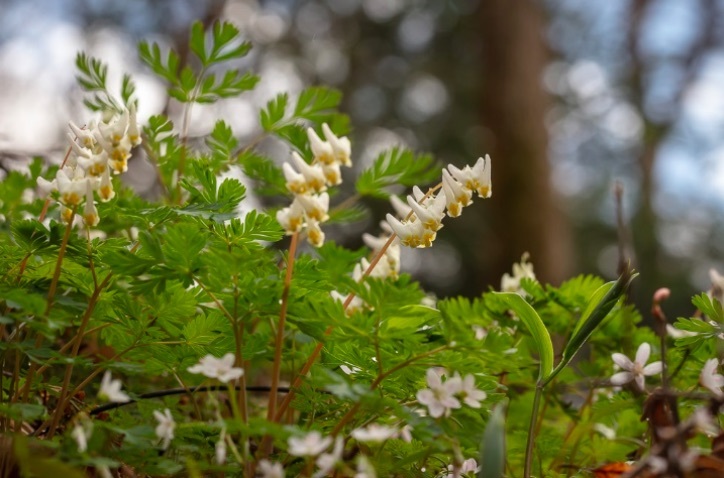 Enjoy a springtime ramble through the gorge and admire the spring wildflower show which carpets the floor of the mature hardwood forest. 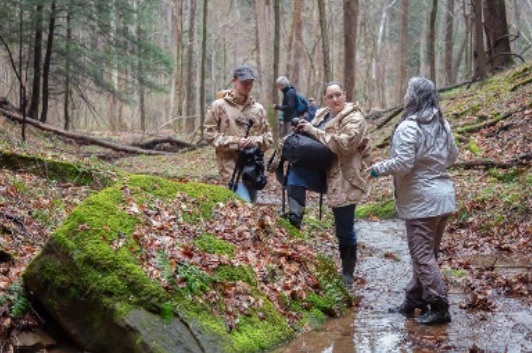 AOA’s Bison Hollow Preserve features spectacular scenery located in the southern extent of the picturesque Hocking Hills, straddling the Hocking – Vinton County line. 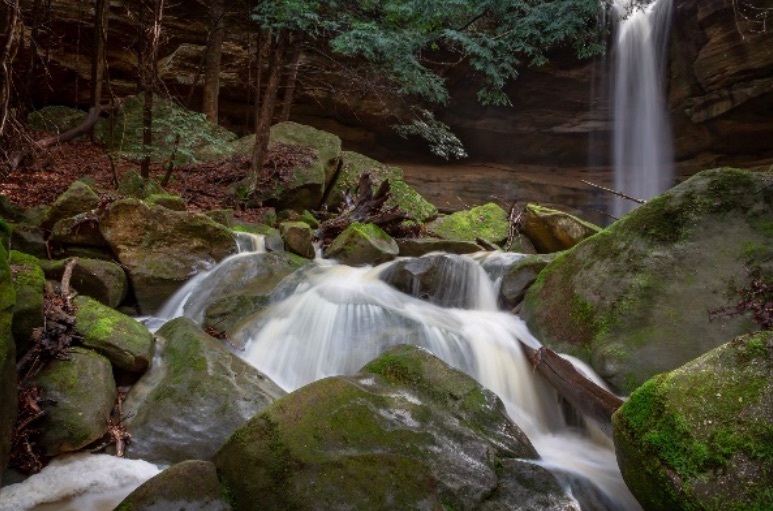 The 400+ acre preserve showcases typical Hocking Hills landscapes including high rock walls that line the sides of the main gorge, sandstone outcrops and numerous waterfalls. The property includes mature to older growth forests with large hemlock groves. It turned out to be a beautiful day for the 14 hardy souls who braved the rainy skies and forecast for the Ephemeral Hike at Bison Hollow. We delayed entering the woods for about 40 minutes until the rain slowed, giving way to a beautiful spring day and blue skies to accent the plethora of blooming wildflowers and gorgeous waterfalls. Most of us spent several hours rambling through the gorge, across streams and up the steep hillsides. Thanks to Angela Carter for driving from Cincinnati to lead the hike and identify the many wildflowers and plants we encountered. Credit to John Potter and Kathy Cubert for the great photos from the day. AOA is squeezing in another hike at Bison Hollow on April 28th for those who still wanting to make this popular trip. 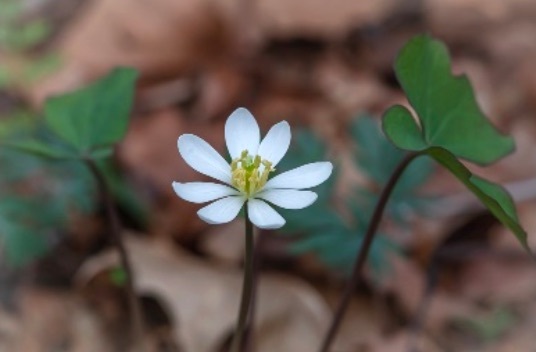 A new cycle of mid-spring wildflowers should be in bloom by then. Capture the beauty of our fabulous Preserves in their finest Spring attire! 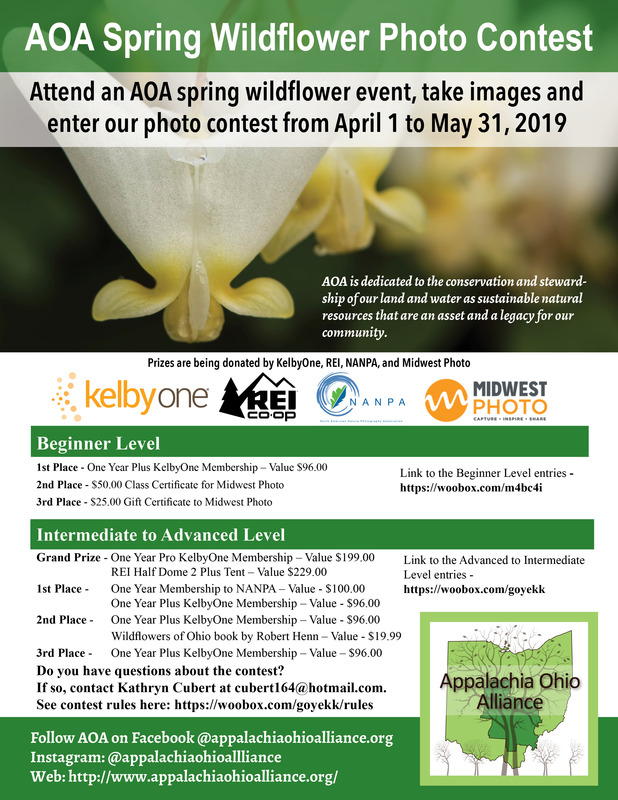 AOA is sponsoring a photo contest focused on springtime wildflowers – April 1 through May 31. 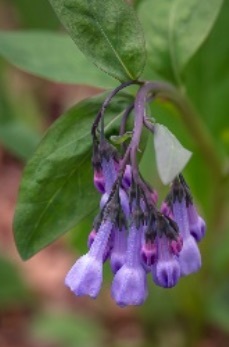 Attend an AOA event at one of our preserves and photograph some of our native wildflowers. All photo entries must be from an AOA property. Rules and entry details will be posted shortly. Photos will be judged by noted nature photographers Jim McCormac and Robert Henn. Prizes donated by REI, NANPA, Kelbyone and Midwest Photo. 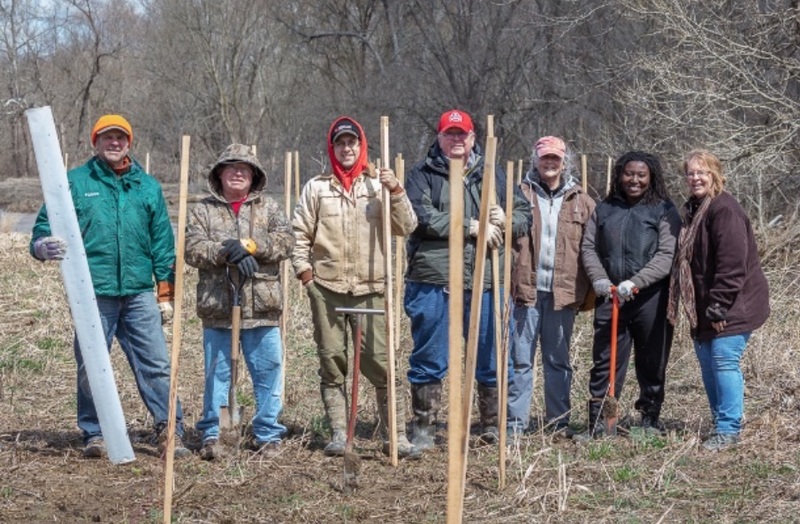 AOA volunteers braved a cold, wet, windy day to plant and stake 300 trees along the Hocking River in southern Fairfield County. The new trees will stabilize an eroding river bank on AOA’s Ellinger Preserve. Reforestation of the fields adjacent to the river will restore the bottomland forests, helping to protect the Hocking River riparian corridor and water quality. Thanks to your support 2018 was another very successful year for land and water conservation. AOA celebrated the conservation of 10 new properties totaling nearly 800 acres. 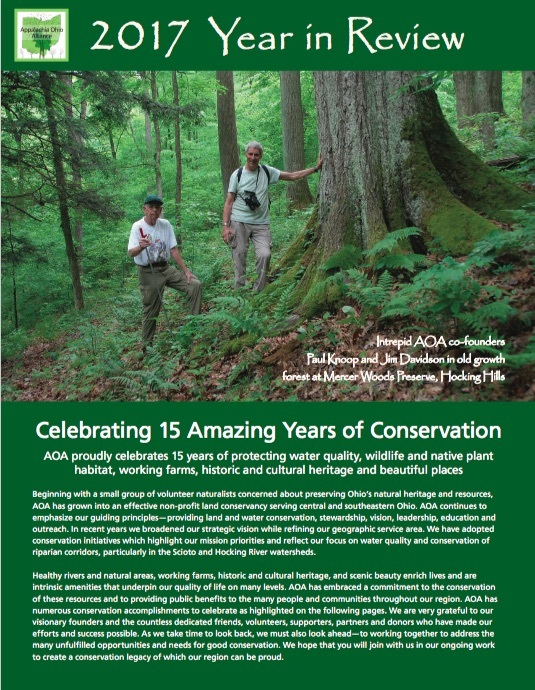 These included over 500 acres along Big Darby Creek and 110 acres in the Hocking Hills, two primary AOA initiatives.. Check out our most recent activities and accomplishments in our most recent Year in Review. If you would like to receive a hard copy via mail, please contact AOA at aoalt@earthlink.net. Two Pickaway County properties were recently added to AOA’s Big Darby Creek Conservation Corridor. Big Darby Creek is a National and State designated Scenic River that is recognized as one of the most diverse waterways in the Midwest. Through this Initiative, AOA seeks to preserve riparian properties and to create a continuous corridor of connected conservation lands to safeguard water quality, natural habitat and scenic qualities of the river. AOA recently closed on the 276-acre Fickardt Farm property located on the west side of the Big Darby, between Circleville and Darbyville. This site will protect 4,440 linear feet of riparian corridor along the river. AOA previously acquired Mishe Moneto, a 255-acre property along Big Darby Creek adjacent to Darbyville. This property includes 1.8 miles of riparian frontage along the river which is home to numerous species of mussels including five that have been listed as threatened and/or endangered. 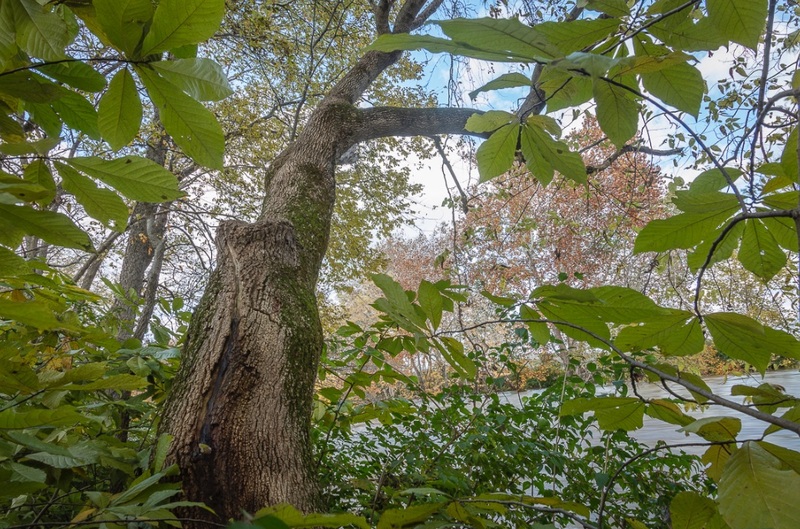 Recent bat studies along the Big Darby identified a number of trees supporting summer maternity colonies of endangered Indiana Bats on these properties. 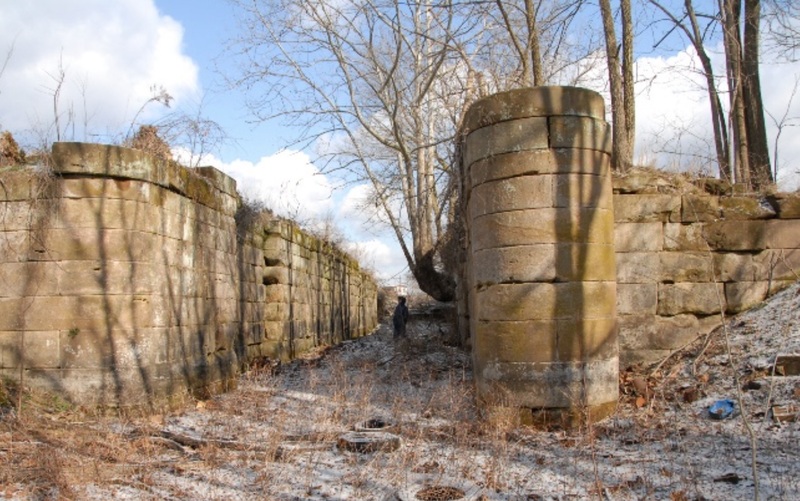 Appalachia Ohio Alliance (AOA) partnered with the Canal Society of Ohio to preserve old Hocking Canal Lock No. 8 and a section of the canal in Fairfield County. The Canal Society donated funds to help purchase the canal structure while AOA utilized Clean Ohio grant funds to purchase the canal property. AOA is very grateful to Ronnie and Rita Williams who owned the lock for their interest in preserving this piece of local heritage and saving it from demolition. This property is part of AOA’s Hocking Canal Heritage Corridor Initiative. 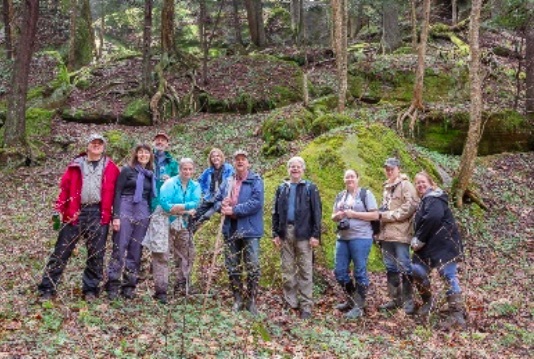 Appalachia Ohio Alliance (AOA) is partnering with several compatible organizations to increase habitat for rare bats in Ohio. A project team, led by prime consultant EnviroScience, Inc., a regional environmental consulting and restoration firm, was selected by the Ohio Department of Transportation (ODOT) to carry out a $5.0 million contract for bat mitigation activities in their Western Management Unit (WMU). AOA and The Conservation Fund, a respected nation-wide conservation organization, are key team members along with several subconsultants. 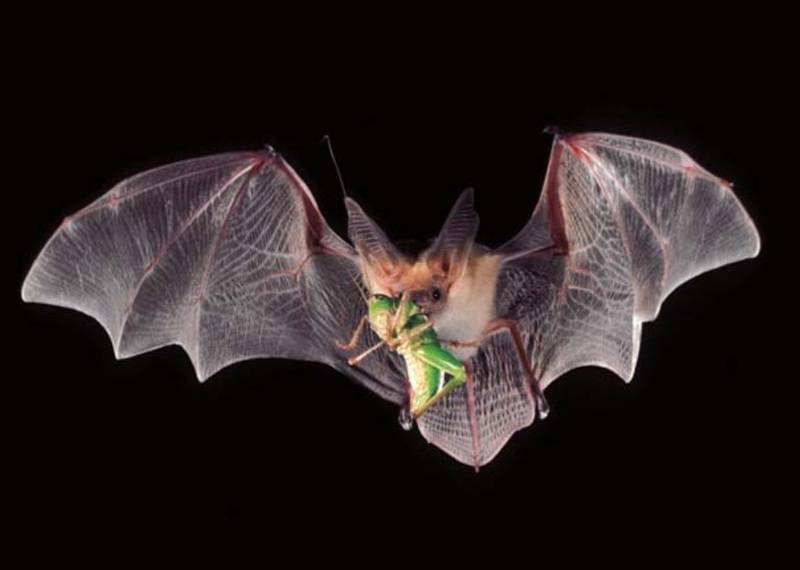 Indiana Bat in flight with Grasshopper meal. 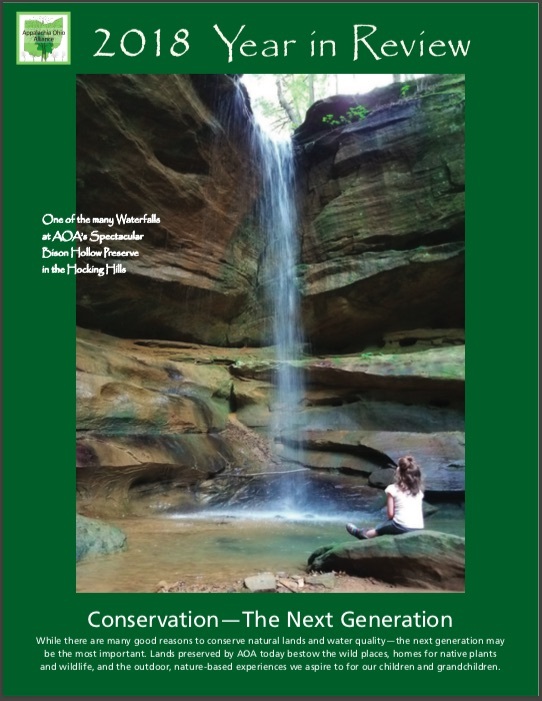 Appalachia Ohio Alliance is a regional non-profit conservancy dedicated to the conservation of land and water resources in central and southeastern Ohio. Find out how you can help our efforts. Get outside with AOA and explore and enjoy the beauty that surrounds us! Download a printable event list. When we consider what it took to create this landscape, we must also consider what we can do to insure that future generations will also be able to marvel at its beauty. The scenic views, diversity of plants and wildlife, and quiet times in the country will all be enhanced by the security of knowing that things can stay this way into the future. In the end, I decided to sell my property to AOA because I love it so much. It was hard to part with it – but I am not really parting with it – it is there forever thanks to AOA.